This unit comes with a hot-dipped galvanized blast pot – integral hand truck assembly; stainless steel control panel, plumbing and components, along with a 10-gallon, UV-protected poly water tank. The EQ100M, when coupled with any air compressor capable of producing 185~350 CFM @ 100+ psi has the ability to blast from 30~130 psi. The EQ100M comes standard with 50 feet of blast hose, pneumatic or electric dead man control, a #7 nozzle, and a low tank water shut-down system. The unit can be loaded into a pickup truck using the slide-rails to assist, or by using the lifting eye. It can be stowed or moved while on its back utilizing the two additional rollers at the handle. The EQ 100M is currently ONLY available for purchase. Please contact us at 1-888-CJSpray (1-888-257-7729) to check on rental availability. 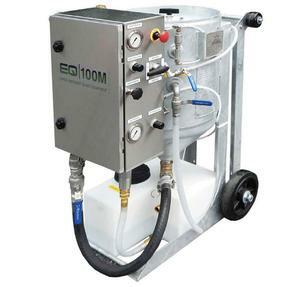 To purchase the EQ 100M, head over to www.CJSpray.com or call us at 1-888-CJSpray for pricing and custom packages. Complete Machine for 1-Year From Original Purchase Date (necessary PM items excluded). Call one of our Spray Equipment Specialists at 1-888-CJSpray for additional information.